·A large size of 59" x 59". ·100% Brand New and High Quality. Made of light soft material, comfortable to touch and keep you warm all day long. 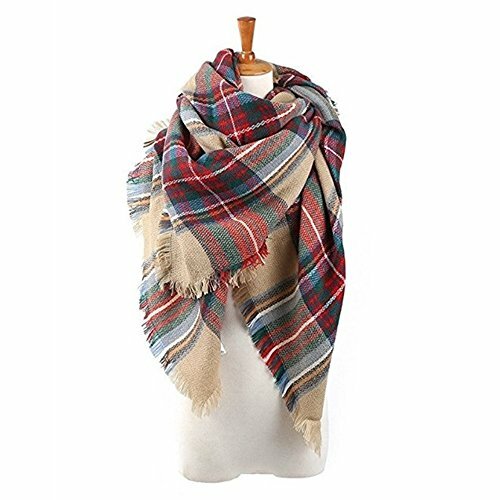 ·The blanket scarf can be folded what kind of ways as you wish. You will be dress up perfectly if you wear it. ·Go great with everything. Great for a jacket in cold weather or sweater. Even it can fit a dress, with leggings or a blouse. ·Suitable for Spring, Autumn, Winter, all the year round. ·Ideal gift for your lover, family and friends. 1. CLASSIC DRAPE. Wrap the blanket scarf around your body as a cover up. 2. BELTED PONCHO. Drape over your shoulders and use a belt to hold everything in place. 3. STYLISH SCARF. Wrap it around your shoulder as a fashion wrapping. 4. SHAWL OR PASHMINA. Fold the square scarf into a half triangle and drape over your body like a shawl blanket. If you have any questions about this product by Echo Paths, contact us by completing and submitting the form below. If you are looking for a specif part number, please include it with your message.